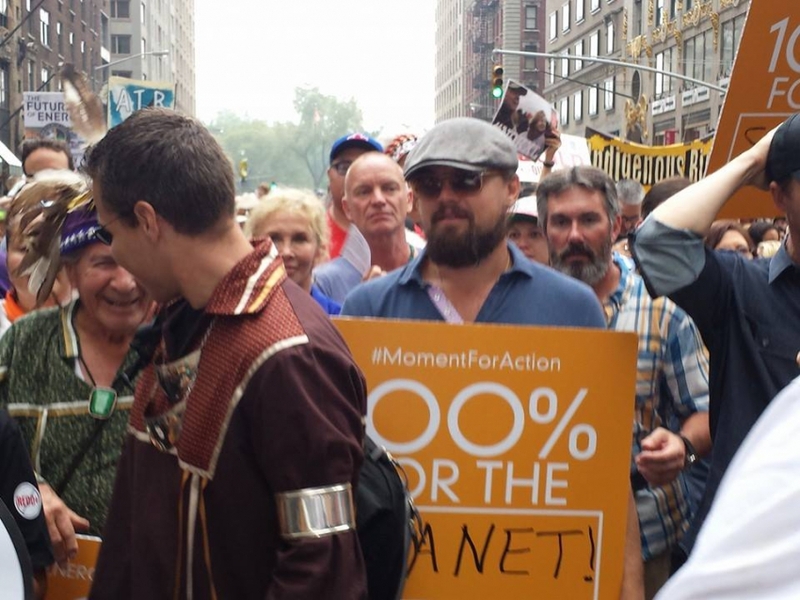 Hollywood star Leonardo DiCaprio and Sting were marching with Canada's Indigenous leaders against the tar sands at the Peoples' Climate March in New York. 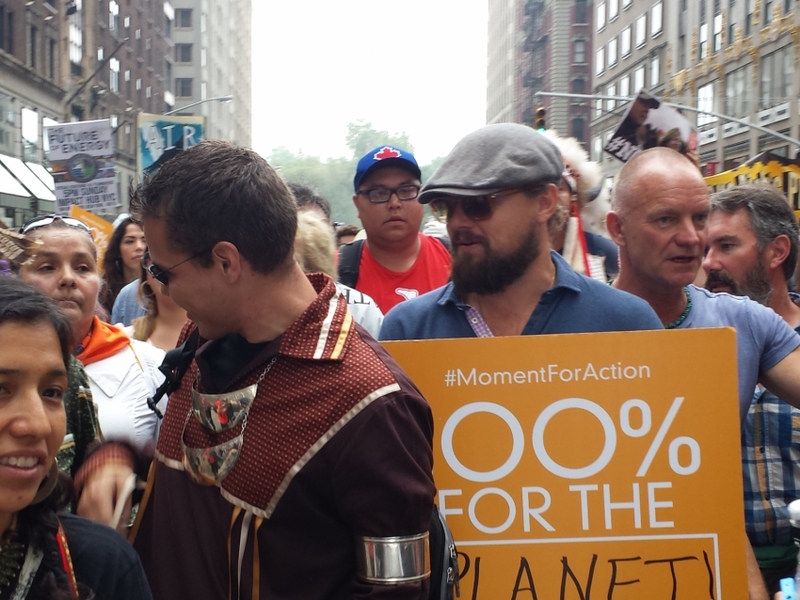 Photo of Leonardo DiCaprio and musician Sting (in blue shirt, behind orange sign) with Indigenous and environmental advocates by Linda Solomon Wood. Hollywood A-lister and Leonardo DiCaprio and music legend Sting are marching with a group of Indigenous peoples at the People's Climate March in New York. They're part of an estimated 400,000 people at the march which has now engulfed New York City, with demonstrators chanting "This is what democracy looks like!" 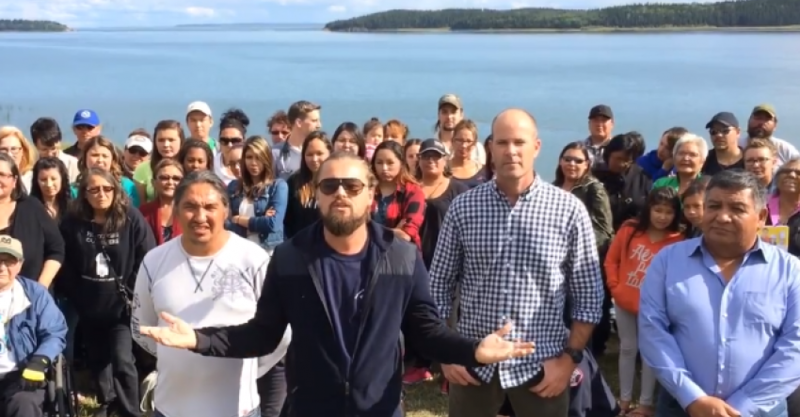 The Wolf of Wall Street star went up to the hamlet of Fort Chipewyan in Alberta last month with director Darren Aronofsky to visit the Athabasca Chipewyan First Nations downstream of the tar sands. He is now with ACFN members as well as Beaver Lake Cree member Crystal Lameman. Although his staff are actively keeping him at a distance from the press, DiCaprio is looking casual in sunglasses and a baseball cap, speaking with the Indigenous leaders who have fought oil corporations for the pollution and health impact caused by oil extraction. Some media, frustrated by the lack of access, questioned why DiCaprio was being kept under such tight security. "He's not a God, but he's very important," said one person who was pushing media away. A hugely diverse group of people have converged for the climate rally, which is expected to be the biggest in history. Anti-war groups nearby are shouting "No war, no warming, climate justice for all! ", while holding banners for peace. Photo by Linda Solomon Wood. The rally is bringing together not only well-known climate advocates like Bill McKibben and Naomi Klein, but also Hollywood celebrities such as Brad Pitt, Susan Sarandon, Mark Ruffalo and unexpected allies such as faith leaders, unions, politicians and legal experts. 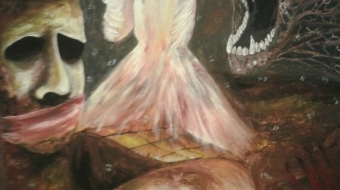 The mood is celebratory and colourful, with people from all over the globe participating. Despite the argument from Republicans and some Democrats in the U.S. that building oil pipelines like Keystone XL will be good for blue-collar jobs, a very different message resonated in the streets today. Unions are out in full force, talking about the need for creating jobs, and saying clean energy would be able to create far more jobs than temporary construction jobs created by bitumen pipelines. Holding a huge banner saying "No fracking", they shouted slogans about putting human need ahead of corporate greed. Nurses and teachers gave powerful speeches at the rally, talking about the need for public health and education. Although the mood was festive, the union members' expressions changed while walking past news corporation buildings. They raised their voices and began shouting angrily about FOX news, clearly upset by the portrayal of unions on the right-wing news broadcast.